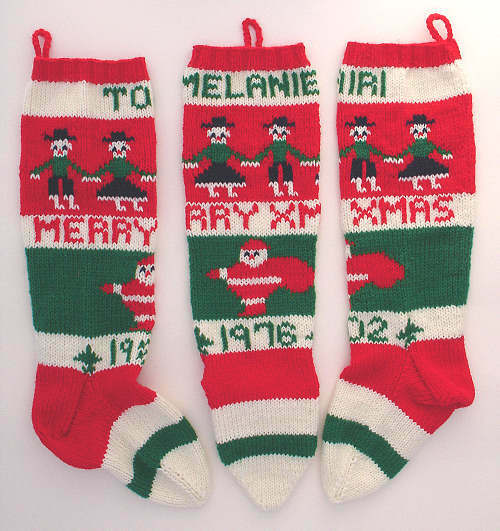 Here are some custom Christmas stockings that I've knit with Santa Claus pictures on them. 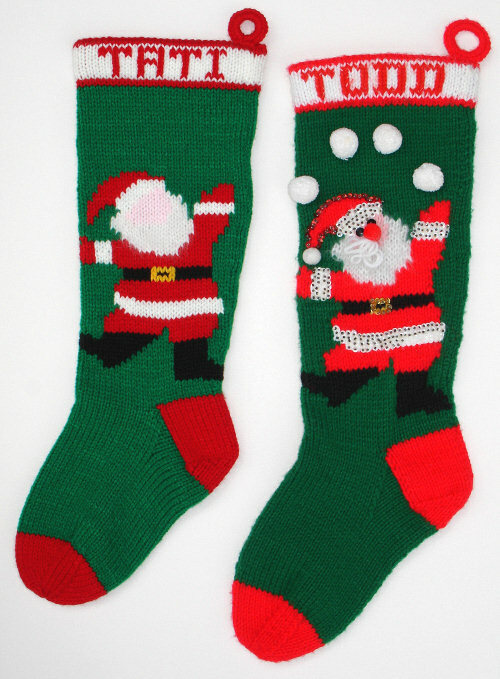 There are dozens, perhaps hundreds, of Santa Claus stocking designs in existence! Both full-figure and face only Santa pictures are popular. He usually does best on a green background, since red and white both figure into the classic look. However, a blue background is also nice. Please look to see what Customers Say about stockings I've knit with Santa Claus pictures. Left-side view of a very unique design. Front view. Colors match the customer's stocking. 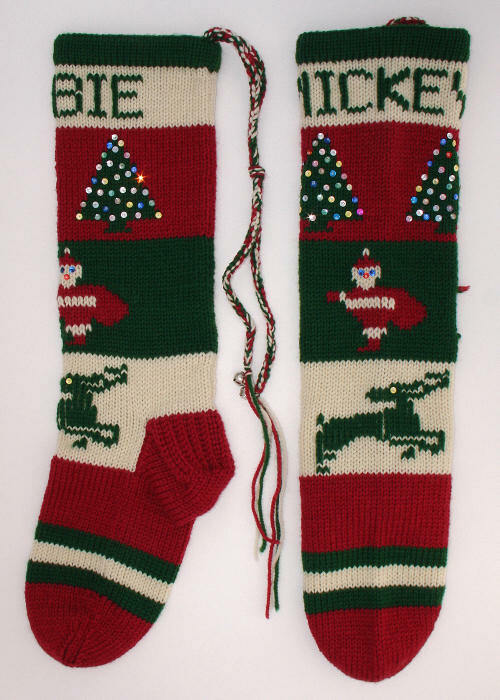 This is a design I had never seen until the customer mailed me her stocking to copy. It could also work nicely on a green background. This is a companion design for the retro-look Santa face below. This customer requested a different color arrangement, and some sequins, eyes, and metallic thread as embellishments. The colors in this stocking match those in the original pattern. The background mantel with a row of green stockings is not in the original pattern. The addition was suggested by the customer. The simplicity of the red and white color scheme makes this a very striking design. The clean lines on the design remind me of a stencil. 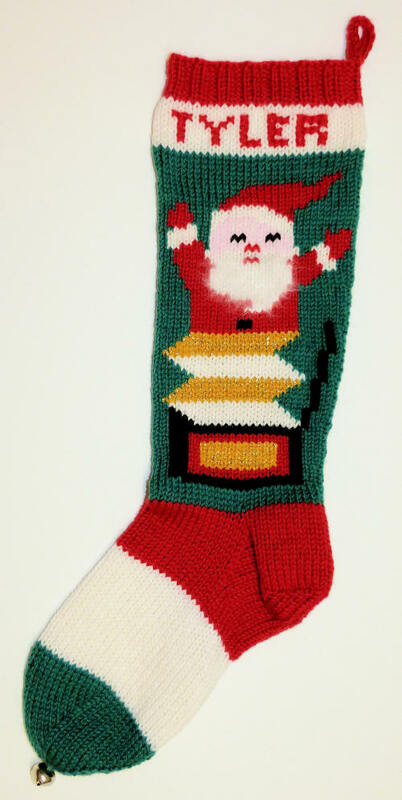 This happy Santa is more difficult to knit than most, but he sure is cute! His beard and suit trim are all in angora. The colors are a little tricky on this design, because the tree needs to show up against the background. Santa doesn't seem to mind, though! This small Santa face could fit into many different designs. Santa rides in his sleigh above the treetops. His fuzzy bag of toys is tied with a green ribbon. See Reindeer Pictures for a look at the reindeer pulling the sleigh. This is a variation of a very old pattern. The white section of the foot has the last two digits of the recipient's birth date. The drawstring with pompoms is an unusual and very nice addition. This Santa face is so large that it wraps around the stocking almost from edge to edge. 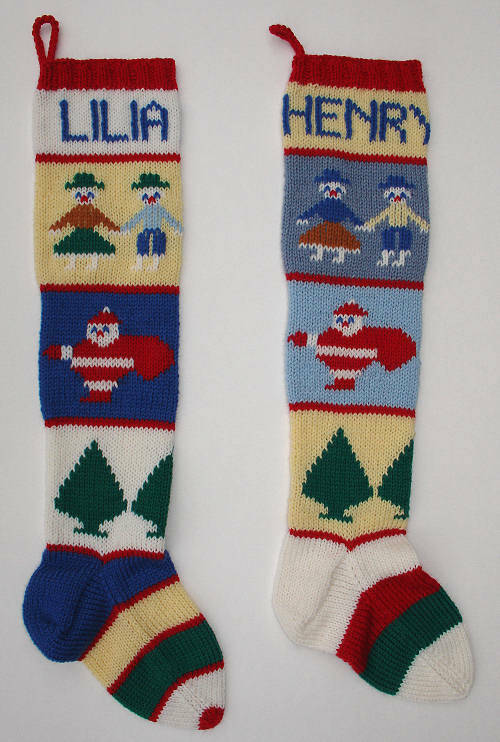 Fortunately, I was asked to knit 2 of them. That way I could get a photo showing the whole face! This stocking has more stitches than usual to accommodate the larger pictures. In the original, Santa has green eyes. The red background and outline-style hat are unusual, and very effective. The same design, but on a green background. This has an interesting and unusual effect. The recipient's initials are added on this side, and the birth date on the reverse. This unusual design has Santa walking a dog off to his right side. See Different Pictures for a view of the fluffy dog. This unusual design has a reindeer peering over Santa's shoulder while Santa checks his list twice. 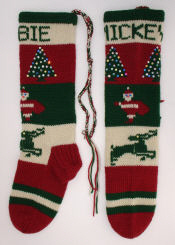 The design wraps all the way around the stocking. A back view shows that the reindeer is right behind Santa's elbow. It almost looks as though Santa is trying not to let the reindeer see the list! There are lots and lots of sequins on this Santa face. Red sequins outline his hat and accent the nose and mouth. Iridescent white sequins outline his hair, eyebrow, mustache, and beard. A few green sequins accent the dip in his hat. 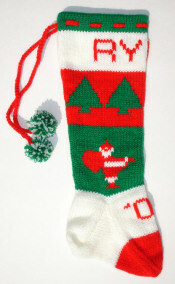 This charming old-fashioned Santa stocking is very involved, but the result is beautiful! Embellishments can be varied somewhat. There is a bit of additional fun on the backside of this design. The same Santa takes on a different look on a darker tan background. This variation has a plain foot, and sequins on the tree. No gifts on the back side of this one, but a couple of sequined ornaments brighten it up. Another old-fashioned Santa picture, done in green this time for an unusual look. The embellishments can vary. The same design, with a tan background instead of the off-white used in the first one. This gave a better contrast for the pure white sections. A couple of extra gifts are hidden on the backside. This simple, cheery Santa face has a very retro look. 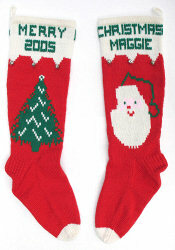 There is a companion design, a Mrs. Santa, which can be seen above. This stocking, and Will's Santa stocking, were for twin boys. 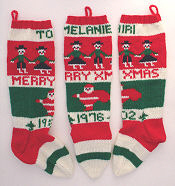 Their parents also had Santa stockings, but with different designs. This plump Santa is very similar to another design, but the proportions are quite different. This is a thinner version of the previous Santa. 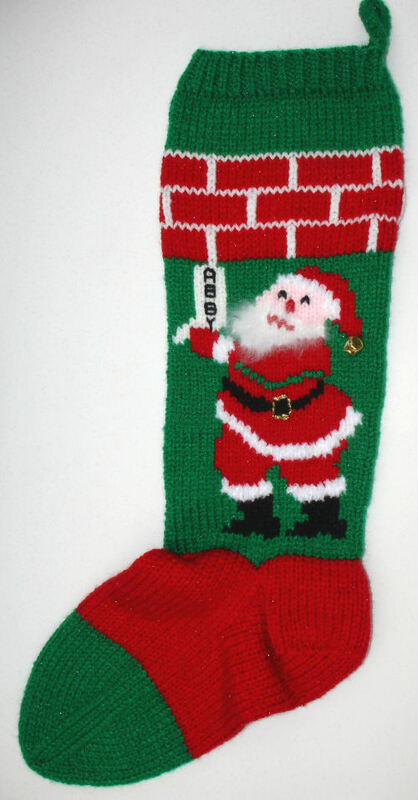 I have seen this stocking with the Santa more heavily embellished. This version has embroidered facial features, gold thread for his belt buckle, and a jingle bell on his hat. It surprised me to see how much the appearance changed with extra white in the background. The picture itself is nearly identical. 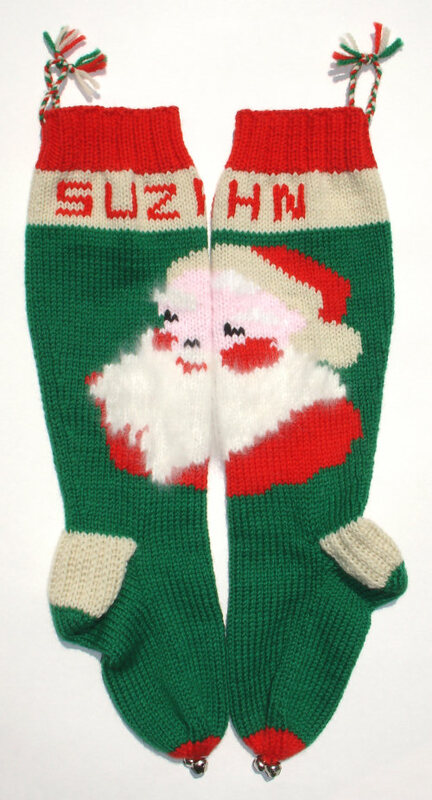 I thought this customer had a very clever idea, to put the name on the stocking that Santa was actually hanging! Of course, only a very short name could be used this way. This is wonderful old design, representing Santa as an old-fashioned jack-in-the-box toy. The original pattern included a white tree with red ornaments on the back side. This cheerful Santa Claus picture is from a pattern provided by the customer. 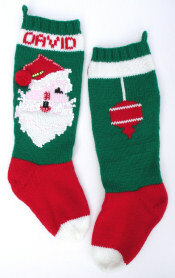 The only embellishment on this stocking is some gold metallic thread on his belt buckle. Added embellishments change Santa's look. Here, he has sequins on his eyes and nose, a pompom on his hat, and a candy cane in his hand. Snowflake sequins sparkle behind him. A customer sent me the stocking on the right to duplicate. She wanted to add the embellishments herself, so I just did the knitting. The hanging loop uses a small plastic ring as its base to give it shape. Santa faces are just as popular as full figures. This simple design is very effective. This is a very popular design, although Santa's eyes are usually black and most families don't have the birth date on there. Here, Santa is combined with a decorated tree and a fanciful reindeer. I love the rich Victorian shades in this wool yarn. This Santa Claus picture is small enough to repeat on each side, as can be seen here. This is a wonderful color variation on a very old pattern. The small Santa can also be centered. These stockings were knit smaller than usual at the customer's request, but the pattern is an old classic that has appeared in many variations. If you'd like a stocking with a Santa Claus picture, find out more about ordering custom Christmas stockings.